Summary: Max calls himself Max the Wolf because he is the leader of his Wolf Patrol of Boy Scouts. He's never been lost. There's not a mystery he can't solve. However, Max is stumped about his current situation. He woke up in the middle of a forest with no memory of how he got there. On top of that, he has met two interesting characters: Branderbock the Badger, McTavish the Cat, and Walden the Bear. Both on a normal basis would be not too odd, but his new companions can talk. Something that is quite unlikely in the world where Max is from. So, Max finds himself in a new adventure trying to find out where he is, why he's there and how he can get home. Sounds easy enough, but throw in troop blue sword wielding hunters who want to kill them and things get a little dicey. What I Think: Bill Willingham has some of the most magical ideas and stories that I have ever read. I've had the honor to read his Fables graphic novels, Peter and Max the companion novel to his graphic novels and now finally his middle grade novel. I find all of them as magical as the last. 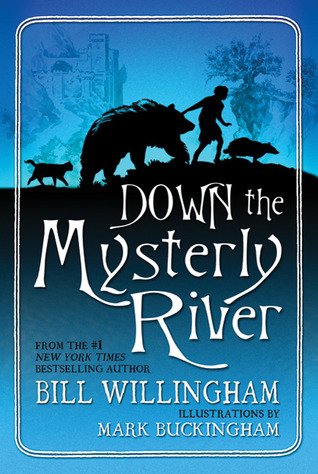 In Down the Mysterly River Bill Willingham has made a world that is unlike any others I have read. Now, I can't tell you what the world is because that is not revealed until the end of the book, but I will tell you that I thought it was brilliant! '"I don't need a strange bear telling me what to do," McTavish said. "These two already think they know everything I should do, and everything I shouldn't do, and that's already too many folks with too many unwelcome nopinions." "McTavish is proud of his elocution," Banderbrock said, with a wry smile. The back and forth between the strong characters made for some pretty great conversations. And speaking of his characters, they are so well developed and you cannot help but fall in love with all of them (even McTavish the mean, disgruntle, ugly cat). They all have such strong personalities and are truly the heart of the story. Lastly, I want to recommend this book even more because of the themes that thread their way throughout the novel. Friendship and goodness are central to the book. Max is always doing what is right for them, not always what is easy. While reading, it makes you feel like no truer friendship had ever existed than the one between Max, Walden, McTavish and Banderbrock. '"Hello? Are you still alive?" he said to the bear, in the kind of extra-loud voice one uses when talking over a bad phone connection, or to someone suspected of not speaking the same language. Writing Prompts: Max has 5 rules of detection. Think of something you are very good at and come up with 5 rules for succeeding at your specialty.